Ketoprak is one type of typical snacks of DKI Jakarta, Indonesia, which uses ketupat as a staple. Ketupat is means rice cake. 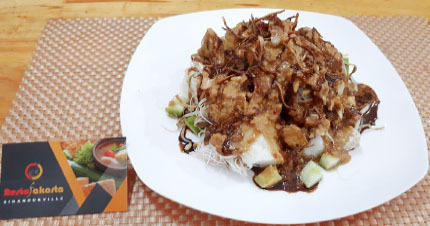 There are vermicelli, sprout, cucumber, peanut sauce, fried onions, sweet soy sauce as well as boiled egg pieces and crackers as a complement to ketoprak.